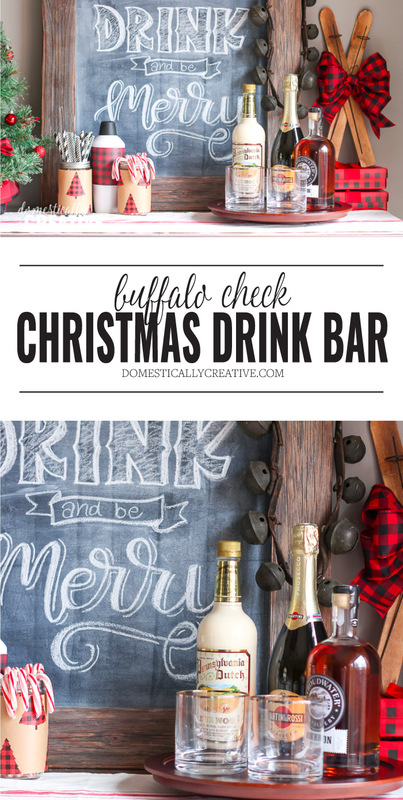 Celebrate the season by putting together your own festive buffalo check Christmas drink bar your guests will love! Serve anything from adult beverages, to hot chocolate and anything in between! 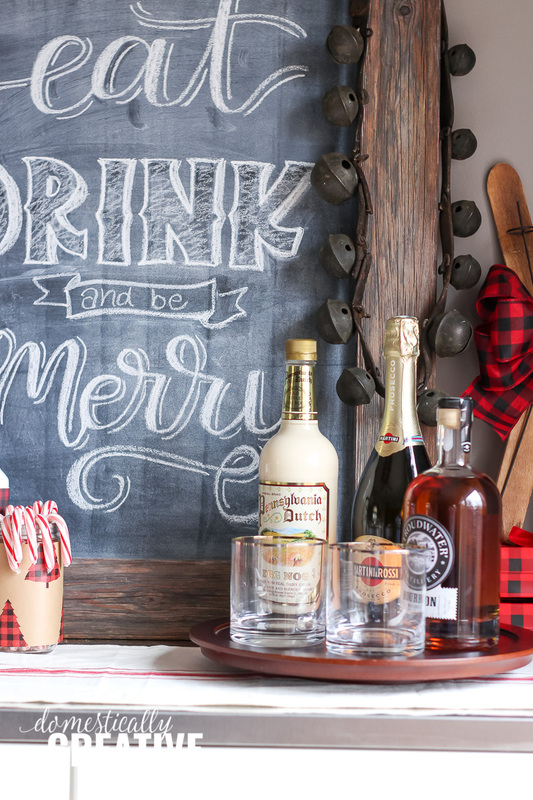 I had so much fun putting together this Christmas drink bar and adding in all of the fun buffalo check accents. 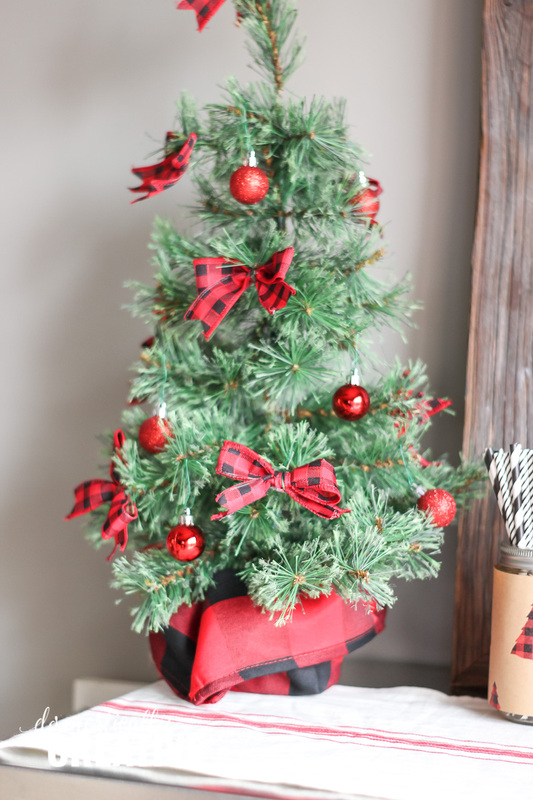 Check out more of the details below and see what the rest of my fellow bloggers are decorating in their homes. Most of these pictures speak for themselves, but I do want to let you in on a little secret. 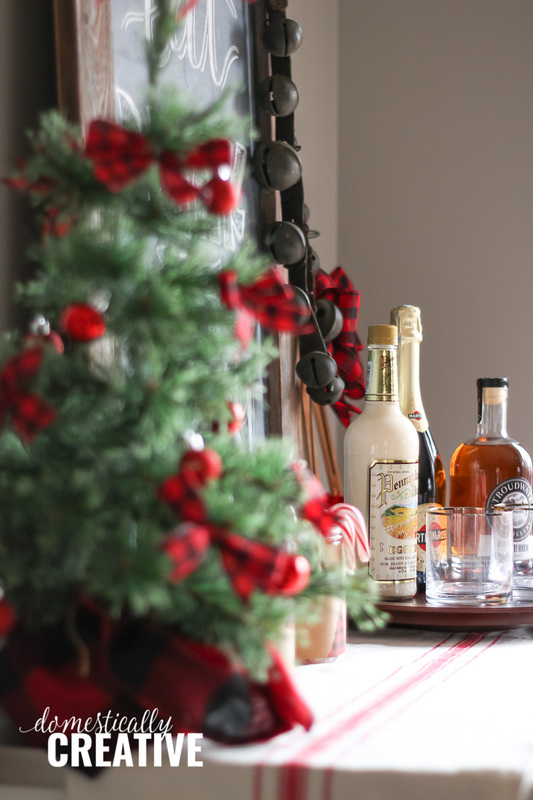 Everything you see on my Christmas drink bar (except the booze!) I either had in my arsenal or I picked up for extremely cheap. I mean SUPER duper cheap. This Christmas season I am all about using what I have! 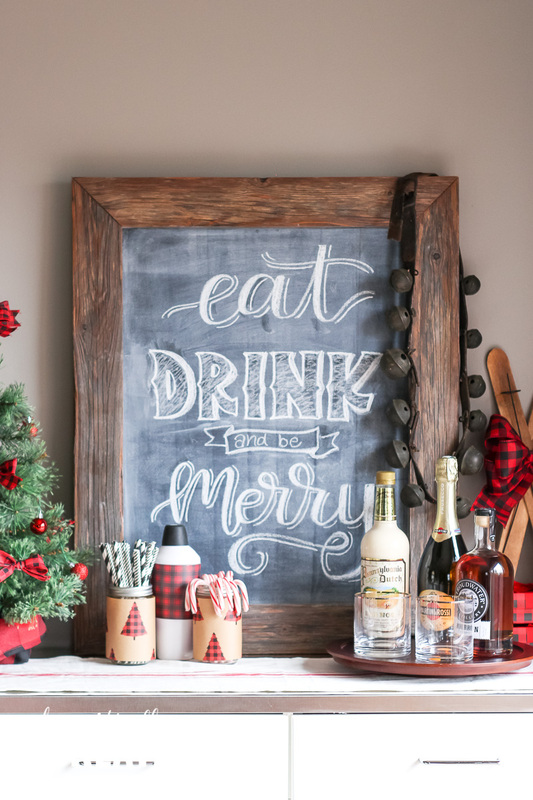 The focal point of my Christmas drink bar, and hot cocoa bar of last year, is this weathered wood chalkboard I made several years ago. It has been used in many different parts of my decorating, and I still see using it for many years to come! I love chalkboard art and lettering and find it to be so therapeutic. Plus it makes such a great impact doesn’t it?! The mason jars are wrapped with some cute wrapping paper I picked up at 70% off at Michael’s. The cocktail shaker is one I already had that I simply wrapped in the same scrapbook paper as these ornaments. See what I mean about CHEAP?! I just simply placed some paper straws I already had (probably purchased from the Target dollar spot) and candy canes inside them for a little accent. This mini tree is one I’ve had for years. I think I got it at Big Lot’s back when we still lived in Tennessee, so it’s definitely had it’s fair share of use. The base was originally wrapped in a burlap, but I wanted it to fit in with the rest of the buffalo check theme. I just simply wrapped it up in a buffalo check napkin I had left over from my wreath project. This way I still have the original burlap, and I can remove the napkin if I change my decor next year. The decorations are small red ball ornaments I’ve had, and bows I tied with some buffalo check ribbon I had in my stash. On the other end of my Buffalo check Christmas drink bar is a pair of miniature skis. I picked these up a few years ago in the Target dollar spot. I simply added a buffalo check bow to dress it up a bit. Then to give them some more height I used some cookie boxes that I also picked up at 70% off at Michael’s. They are perfect! Of course no Christmas drink bar is complete without the drinks! These are just a few of my husband and I’s favorites, and the whiskey glasses were a gift to him last year (he’s a whiskey guy!) If you have a whiskey lover on your gift list this year, make sure you check out my Whiskey Lover’s Gift Guide! One thing I absolutely love about this drink bar are these vintage sleigh bells my mom gave me. I believe she found them in an old farmhouse we lived in when I was very young. I remember her decorating with them every Christmas when I was a kid, so when she asked if I wanted them I of course said yes. I want to restore the bells some and give the strap a little love after this season. If you know the best way of going about restoring old sleigh bells then I would love to know! After researching a bit I think these babies are from the mid 1800’s! Which is crazy to even think about! 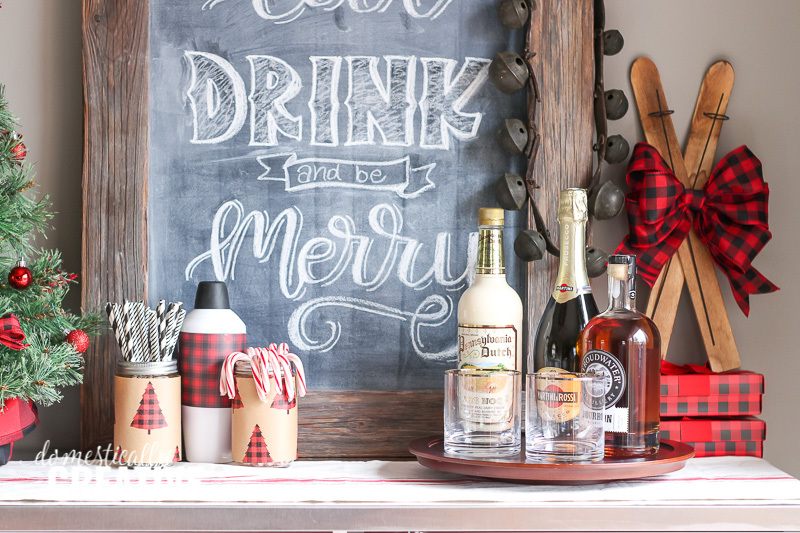 This Christmas drink bar is almost too pretty to use….almost! I may be guilty of pouring myself a glass of that Prosecco when I was finished with pictures. So cute! I love all of it, your style is awesome! Great idea to use napkins. I’m also trying to use what I have this Christmas too! You are so sweet Jenny! 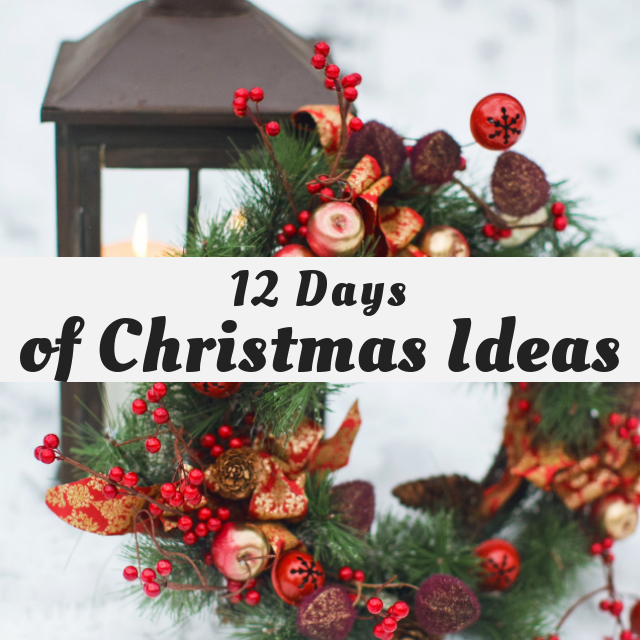 It’s really nice not to have to stress about what to buy this year to decorate with! 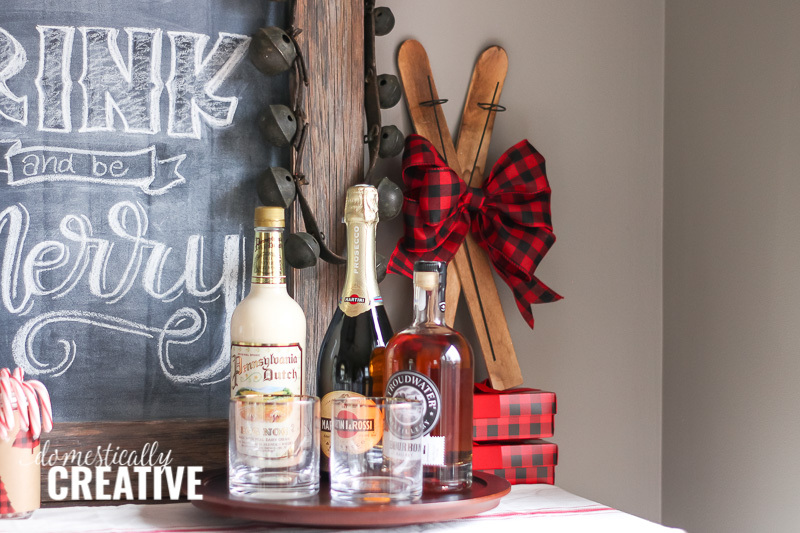 I absolutely love your drink bar and the vintage sleigh bells are beautiful! Love love your drink bar! 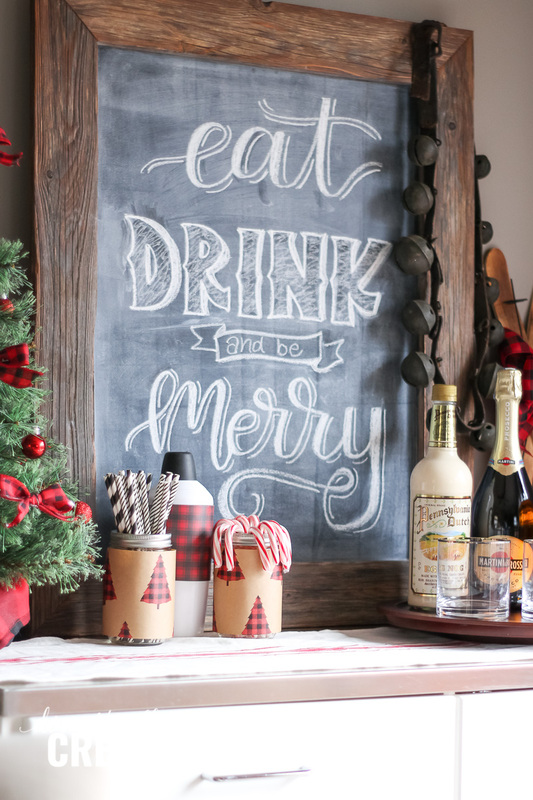 The buffalo check looks so festive and I really love your chalkboard lettering! Thank you so much Tania! Chalk lettering is so therapeutic! I love your presentation of drink station. The sleigh bells are a fantastic touch. I’m so thrilled you were able to get some inspiration for your mini tree Marie!! Thank you so much for the kind words! I really love this decor, and that you did it mostly with what you have. Vintage sleigh bells from your Mom, you cannot get more Christmasy then that. What an heirloom treasure. Beautiful decor, I want all of it lol. 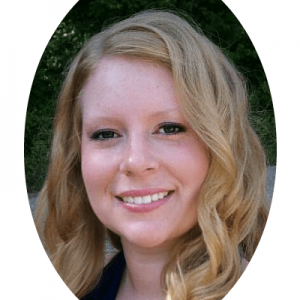 Leanna, thank you so much for your sweet comment! I love those sleigh bells and will most definitely treasure them for years to come! 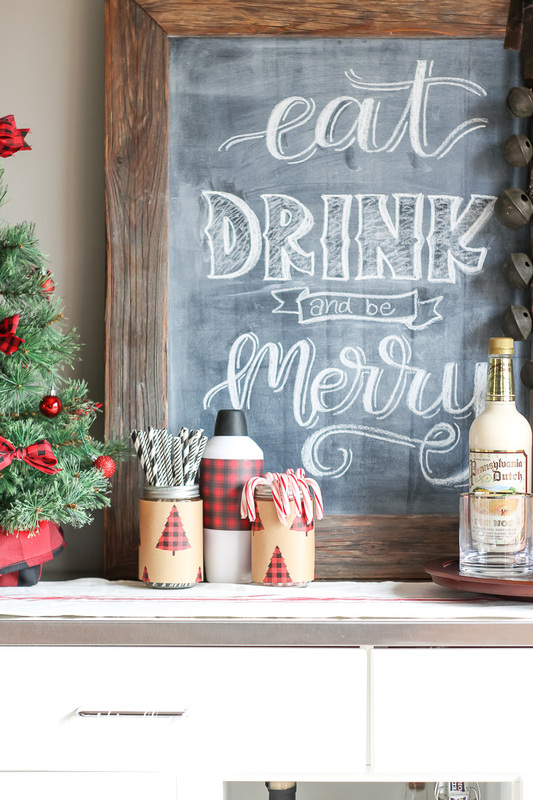 Love your Christmas drink bar! 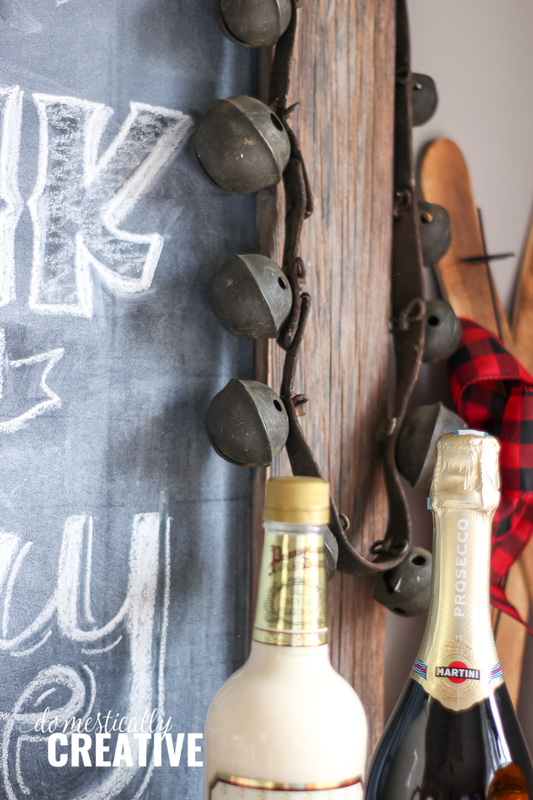 The chalkboard and sleigh bells give it that vintage charm, and the buffalo check is so festive. Your drink bar is fabulous, Amanda. I love the chalk board and your lettering is wonderful. All the details tie in together for such a festive look. Thank you Beverly! I have so much fun with that chalkboard. I love your bar! I especially like the tree paper on the jars. 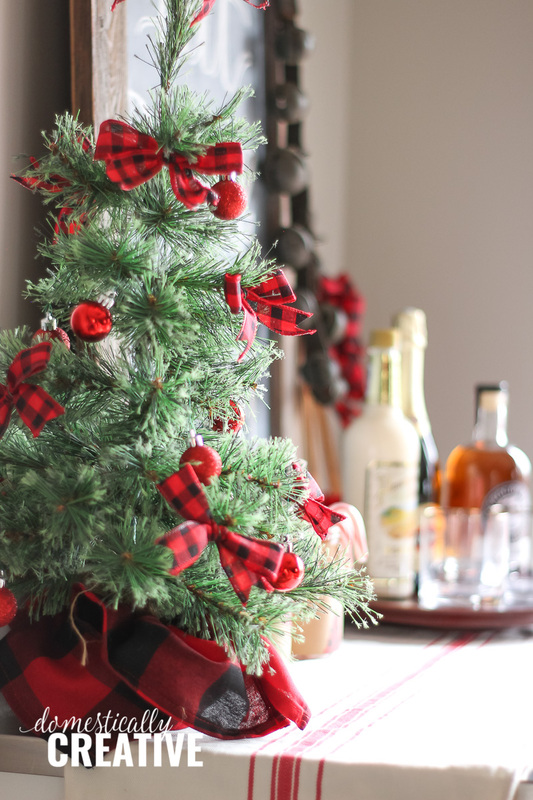 This is such a fun idea and I love all the buffalo check accents. I also love that you used what you had on hand with just a few inexpensive purchases.